If your #lifegoals include living off the grid in some stunning locale, then check this out: we’ve rounded up the best pod homes that can be installed in even the most remote locations. From a futuristic 3D-printed shelter to the nature-influenced Baobed, there’s something for every world traveler (and almost every budget). Pod Space’s award winning pre-fab pods can be installed just about anywhere you can dream of. The modular pods are customizable, so you can use them as a backyard office, an extra room, or even a fully-equipped tiny home. The best part is the floor-to-ceiling windows, so you can let nature in while keeping the elements out. 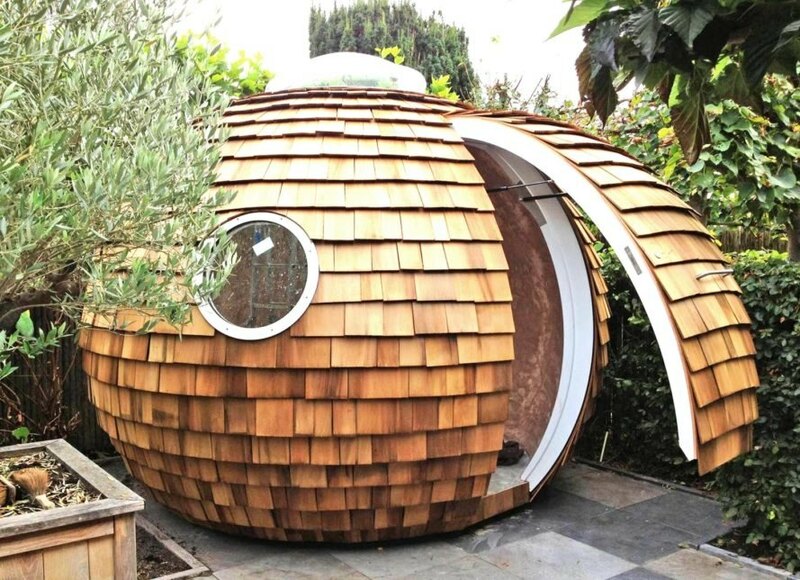 If you are the type to think outside the box – literally – you’ll dig the spherical Podzook. With its locally-sourced shingled wood exterior and its space-age interior, the Podzook is what you’d get if you combined traditional Maine craftsmanship with an alien space pod. Each one is made to order and comes with a skylight and a futuristic gull-wing door. Prices range from 28 – 32k depending on the options you choose. Architecture firm SOM is taking off-grid living into the future with a 3D-printed shelter that looks like something out of a sci-fi movie. It features rooftop solar panels for power and comes with its own vehicle that generates its own power. Best of all, the structure and the vehicle can share power wirelessly when you need an extra bit of juice. The SOM shelter can be “printed” right on site, illustrating what is possible in the future of home building. The 65k ALPOD is a high-tech solution to skyrocketing real estate prices. The prefabricated structure is made of lightweight aluminum, so it can be moved where needed and then recycled when has reached the end of its life. The pods can even be stacked, so you could create an entire skyscraper of them. 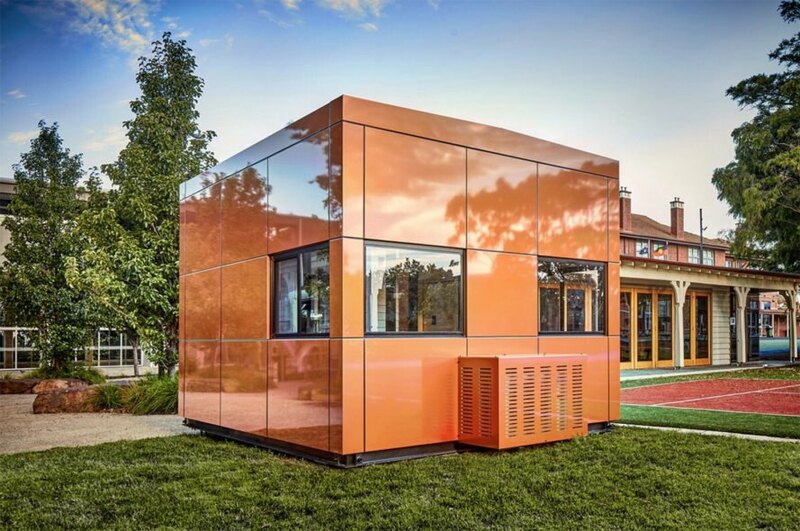 With 480-square feet of living space, it’s a great solution for both urban locations, since it can be hooked up to the grid, and off-grid with it solar power option. POD-Idladla is a prefabricated home that can be shipped flat-packed for on-site assembly in a snap. The 186-square foot tiny home is powered by solar energy and is modular, so it can be expanded if necessary. Tall ceilings help make the space feel large without increasing its footprint, and costs start at just $15k. 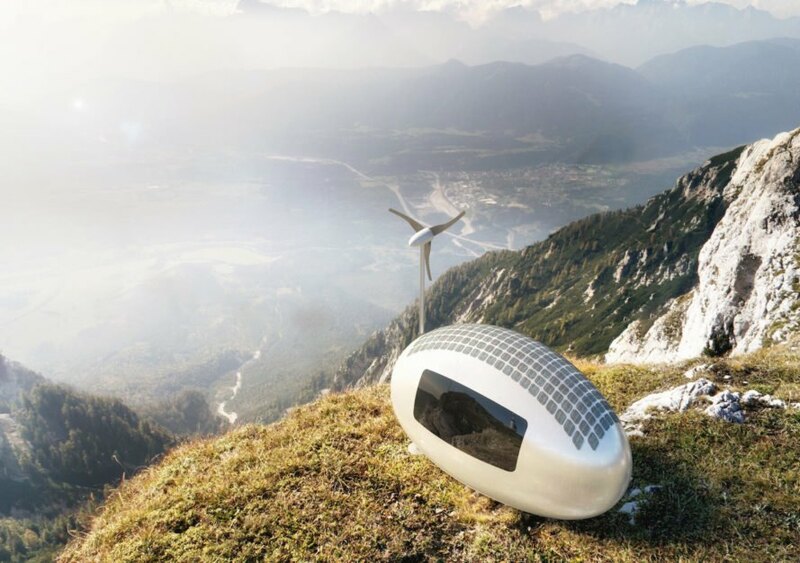 The egg-shaped Ecocapsule is the stuff that off-grid dreams are made of. The ultra-portable house is powered by solar and wind, with rainwater collection and filtration built-in. The 86-square foot space manages to pack a lot of features, with a folding bed, dining area, shower and toilet, storage and a kitchenette. Each capsule fits inside a shipping container so it can go nearly anywhere. Ecocapsule homes start shipping this year, so save your pennies, because owning one will set you back $94,000. The DROP Eco-Hotel is different because it isn’t designed as a permanent home, but as a pod-like hotel room for modern nomads that can be installed in some truly incredible places – including elevated above the earth. The prefabricated structure is clad in slotted wood to control solar gain, features a skylight for daylighting and a rainwater recycling system. The Harwyn Pod is a tiny space for distraction-free work. Designed to be an office, art space or yoga studio, each pod can pop-up on-site in just 5 hours and comes complete with built-in furniture. With a footprint of only 2.5 by 2 meters and luxury car-inspired design, each tiny dwelling is fully insulated against the elements. 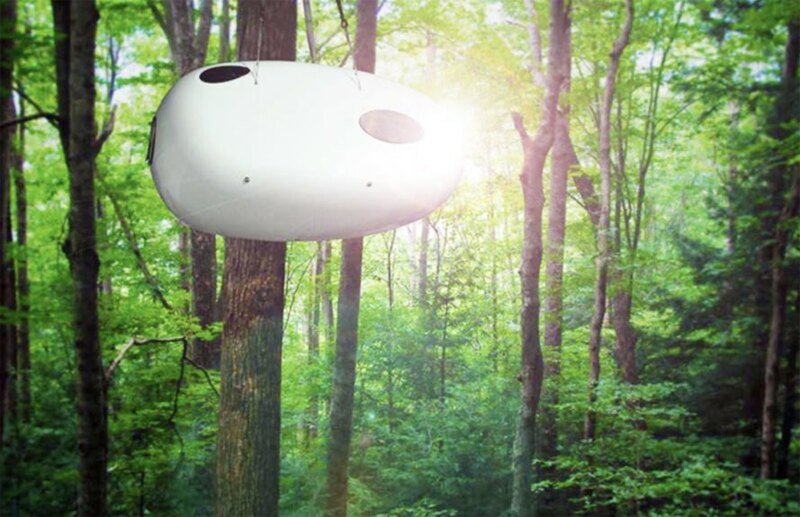 The Baobed pod is a treehouse for adventure-seekers. The sleek pod can be suspended in the treetops, nestled on a beach, and plopped on a rooftop or even in the middle of a pond. The fruit-like shape was inspired by the fruit of the baobab tree and provides a tiny, safe space for travelers. Thanks to its tiny footprint and light weight (just 992 pounds), it can be transported on a trailer and can be equipped with a platform, mosquito nets and storage options. If your #lifegoals include living off the grid in some stunning locale, then check this out: we've rounded up the best off-grid living pods that can be installed almost anywhere so that you can realize your dreams of living in even the most remote location. From the futuristic 3D-printed SOM shelter, to the nature-influenced Baobed, there's something for every world traveler (and almost every budget). Pod Space Pod Space's award winning pre-fab pods can be installed just about anywhere you can dream of. 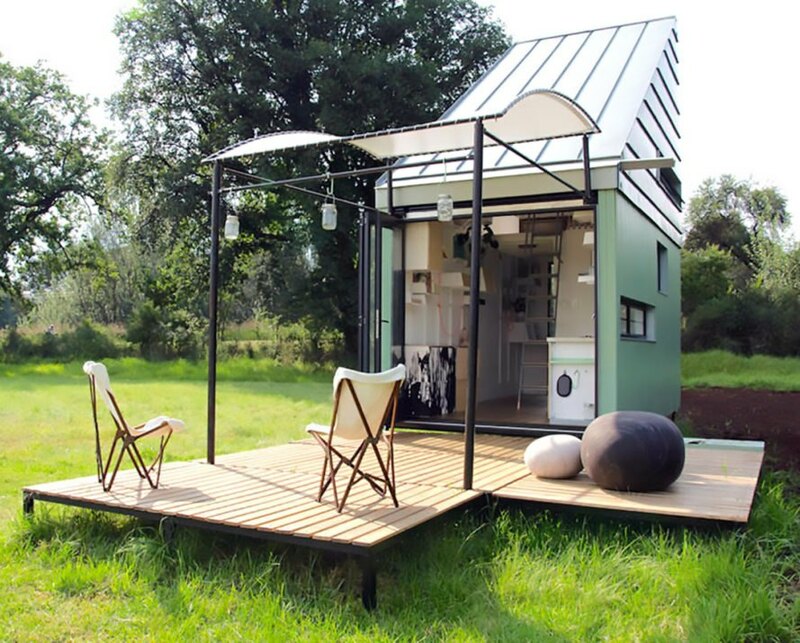 The modular pods are customizable, so you can use them as a backyard office, an extra room, or even a fully-equipped tiny home. The best part is the floor-to-ceiling windows, so you can let nature in while keeping the elements out. Podzook If you are the type to think outside the box - literally - you'll dig the spherical Podzook. With its locally-sourced shingled wood exterior and its space-age interior, the Podzook is what you'd get if you combined traditional Maine craftsmanship with an alien space pod. Each one is made to order and comes with a skylight and a futuristic gull-wing door. Prices range from 28 - 32k depending on the options you choose. 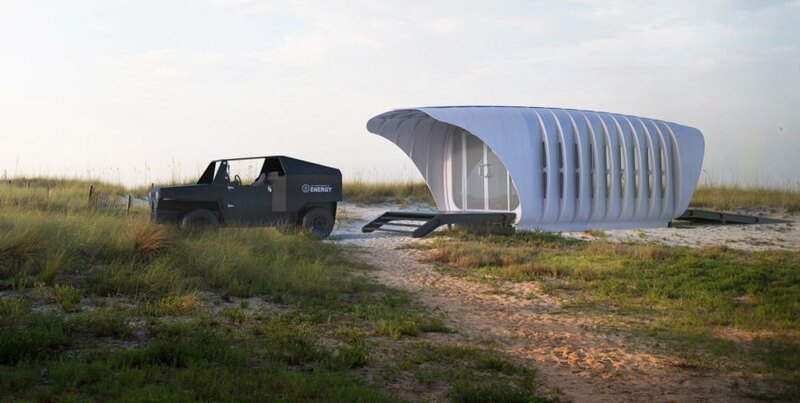 3D-Printed SOM shelter Architecture firm SOM is taking off-grid living into the future with a 3D-printed shelter that looks like something out of a sci-fi movie. It features rooftop solar panels for power and comes with its own vehicle that generates its own power. Best of all, the structure and the vehicle can share power wirelessly when you need an extra bit of juice. The SOM shelter can be "printed" right on site, illustrating what is possible in the future of home building. ALPOD The 65k ALPOD is a high-tech solution to skyrocketing real estate prices. The prefabricated structure is made of lightweight aluminum, so it can be moved where needed and then recycled when has reached the end of its life. The pods can even be stacked, so you could create an entire skyscraper of them. 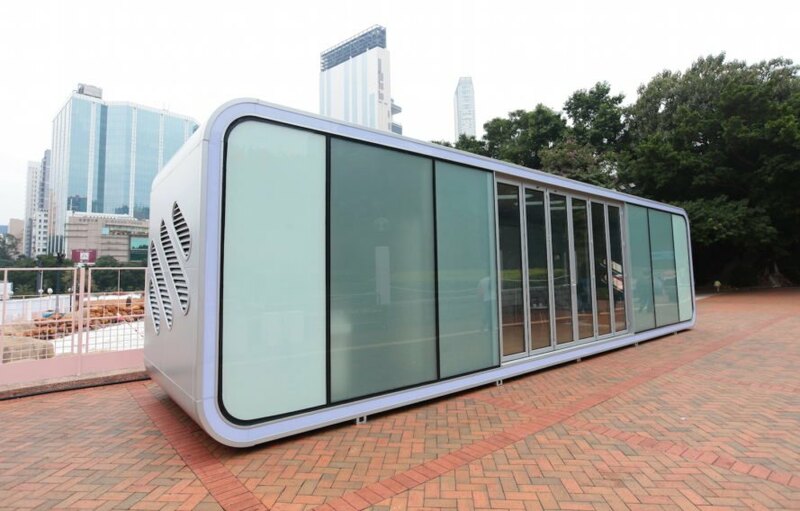 With 480-square feet of living space, it's a great solution for both urban locations, since it can be hooked up to the grid, and off-grid with it solar power option. POD-Idlada POD-Idladla is a prefabricated home that can be shipped flat-packed for on-site assembly in a snap. 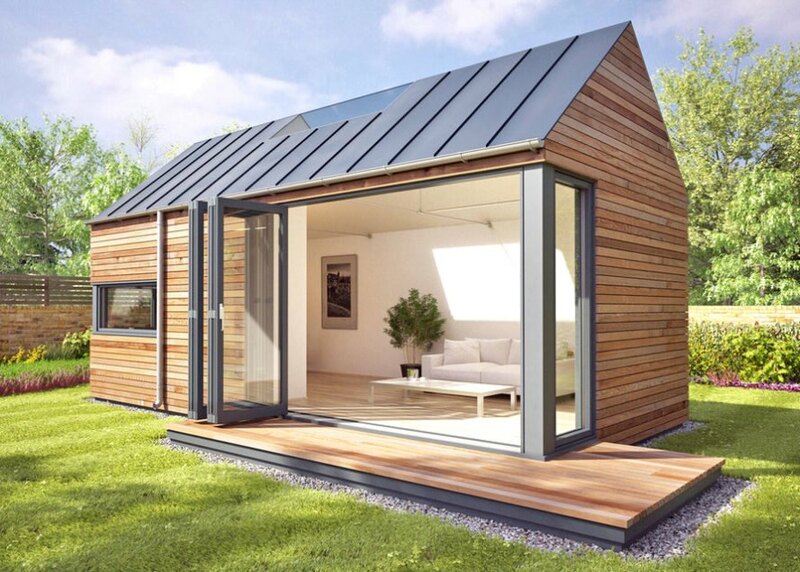 The 186-square foot tiny home is powered by solar energy and is modular, so it can be expanded if necessary. Tall ceilings help make the space feel large without increasing its footprint, and costs start at just $15k. Ecocapsule The egg-shaped Ecocapsule is the stuff that off-grid dreams are made of. The ultra-portable house is powered by solar and wind, with rainwater collection and filtration built-in. The 86-square foot space manages to pack a lot of features, with a folding bed, dining area, shower and toilet, storage and a kitchenette. Each capsule fits inside a shipping container so it can go nearly anywhere. 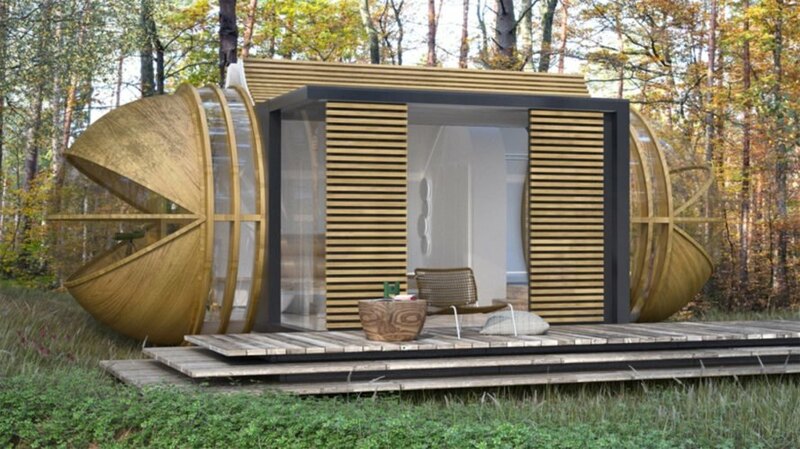 Ecocapsule homes start shipping this year, so save your pennies, because owning one will set you back $94,000. Drop Pod The DROP Eco-Hotel is different because it isn't designed as a permanent home, but as a pod-like hotel room for modern nomads that can be installed in some truly incredible places - including elevated above the earth. The prefabricated structure is clad in slotted wood to control solar gain, features a skylight for daylighting and a rainwater recycling system. Harwyn Pod The Harwyn Pod is a tiny space for distraction-free work. Designed to be an office, art space or yoga studio, each pod can pop-up on-site in just 5 hours and comes complete with built-in furniture. With a footprint of only 2.5 by 2 meters and luxury car-inspired design, each tiny dwelling is fully insulated against the elements. Baobed Sleeping Pod The Baobed pod is a treehouse for adventure-seekers. The sleek pod can be suspended in the treetops, nestled on a beach, and plopped on a rooftop or even in the middle of a pond. The fruit-like shape was inspired by the fruit of the baobab tree and provides a tiny, safe space for travelers. Thanks to its tiny footprint and light weight (just 992 pounds), it can be transported on a trailer and can be equipped with a platform, mosquito nets and storage options.